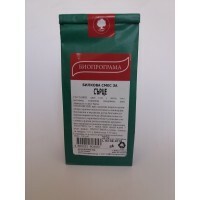 Usage: Favorably affects ill health as a result of overeating, helps for good metabolism. Support the functions of the gastrointestinal tract, promotes normal function of the digestive system free of heartburn and flatulence when wrong food combinations are used. Ingredients: St.John's wort herb, common centaury herb, valerian roots, plantain leaves, peppermint leaves. Preparation: 1 tablespoon brewed with 250 ml boiling water for 5-10 minutes. Serving size: 1 tea cup before meals, three times per day.